Ghost stories are sometimes more comforting than scary. In this episode, we'll examine Spiritualism through the life of First Lady Mary Todd Lincoln. I'll also introduce you to a modern Spiritualist minister, and tell you all about my fool-proof retirement plan. There are so many primary sources for this episode, it’s incredible. Looking at a historical period with as much intimate documentation of people’s lives as we have is just a complete delight. There are a ton of publications by Spiritualists from the 1800’s. Which is excellent because you can really get a primary source perspective on what’s going on. That being said, their writings are never objective, so keep in mind that what you’re reading isn’t necessarily fact so much as what the author was thinking at the time. This is a great discussion of the movement of Spiritualism more broadly by a woman who was very involved in it. Keep in mind this is considering 1870 to be modern. This is the book with the account of the famous White House piano incident. Nettie worked with Mary Todd Lincoln a number of times, and claims to have been quite influential to Abraham as well. This is a very poetic autobiography of a Spiritualist activist with a fascinating life story. Davis was key in helping the general structure of Spiritualism’s beliefs to coalesce. If you want to learn more about modern Spiritualists, there’s plenty to explore. I found this sermon on the role of Spiritualism in a time of war to be particularly lovely, but there’s a ton of stuff on this site that’s interesting. Also, check out some resources from the Center for Spiritual Enlightenment, where Rita is an ordained minister. This is an image from Nettie Colburn's book. That's supposed to be her there with Lincoln. They probably did meet at some point in time, so maybe this happened? I don't know. That's Mary Todd Lincoln on the left. Next to her is the eldest son Robert, the only one who survived to be an adult. Tad is next to Abe, looking down. He would die at eighteen. Eddie and Willie had already passed away. Abraham, of course, is on the far right. If you have the opportunity, I can’t recommend enough that you go visit President Lincoln’s Cottage, in Washington, D.C. If you live in this area, take a minute to be a tourist in your own city. If you’re visiting DC, this is a museum you might have overlooked in favor of the Smithsonians (no offense to the Smithsonians). But if you’ve got the chance, this is an excellent gem. 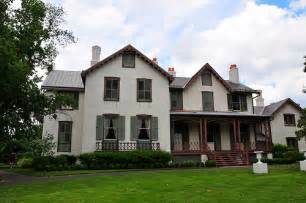 You can find more information about President Lincoln’s Cottage on their website. There’s also a more fleshed out discussion of the séance in the library. It’s actually an excellent discussion of what happened, but we just didn’t have time to go into all the details in the episode. This is President Lincoln's Cottage, in all of its tasteful glory. There a ton of biographical information about the Lincolns out there as well. I’m not going to list out all the biographies of Abraham Lincoln there are in the world because there are too many and also I didn’t read them. There’s tons of books, but there’s also plenty of articles you can find around the web. There’s a great write-up of the history of First Ladies and the occult. Actually, firstladies.org has a lot of fascinating info about First Ladies, so go ahead and take your time perusing if you like that sort of thing. Personally, I really enjoyed it. There’s also a discussion of the connection between a certain spiritualist and Lincoln’s assassination which I found absolutely fascinating. If you’re looking for a great academic discussion of Spiritualism, there’s a lot to choose from. A book that I relied on for this episode is Body and Soul: A Sympathetic History of American Spiritualism by Robert S. Cox. It’s called a ‘sympathetic’ history because he discusses emotions a lot, not because he’s overly sympathetic to Spiritualism. If you want a really aggressive overview for the whole thing, take a look at The Ashgate Research Companion to Nineteenth-Century Spiritualism and the Occult, edited by Tatiana Kontou and Sarah Wilburn. Here is that review of Nancy Drew, Message in a Haunted Mansion. I really did love this computer game, but I always got stuck at the puzzle box right at the very end. Alas. This is an image of what a performance by the Davenport brothers looked like. The séance in the library of President Lincoln's Cottage involved some 'instruments playing on their own' as well. But it turned out to be a guy hiding in the dark playing instruments.